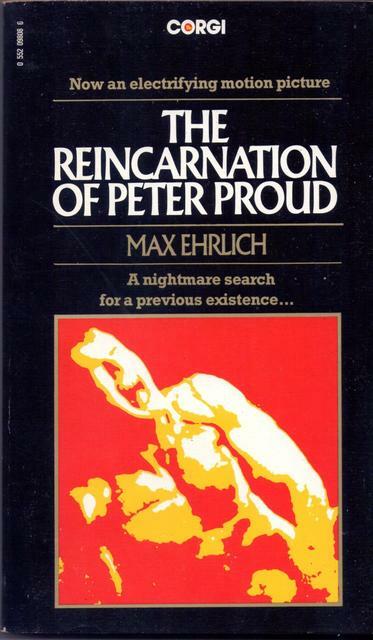 The Reincarnation of Peter Proud by Max Ehrlich | Vault Of Evil: Brit Horror Pulp Plus! Peter Proud is an associate professor at UCLA, specialising in American Indian studies. He is 27 years old, athletic, good-looking, successful, affluent and virile. On the face of it someone possessed of an enviable and serene existence. Or at least he would be were it not for the dreams. Because Proud is tormented by a succession of uncommonly vivid dreams, of people and places wholly outside of his own personal experience. They never vary in the slightest degree, recur at increasingly regular intervals and, most troubling of all, always culminate with his being murdered in a moonlit lake. As his disrupted sleep patterns begin to impact alarmingly on his daytime activities Proud finds himself compelled to seek help, firstly from conventional circles but then in increasing desperation from fringe therapies. But with each successive failure Proud slowly comes to accept that his disturbing visions are not dreams at all but rather residual memories of a previous existence. Thus begins a journey to discover not only who he once was and where he lived but also to understand what it was that motivated the beautiful and mysterious Marcia to bludgeon him repeatedly with an oar and leave him to drown in those freezing waters. This is an utterly enthralling and compulsive page turner of a book. It combines effective creeps - such as when Proud freaks his girlfriend out by shouting in his sleep in another man's voice - with fascinating cultural background information relating to the Iroquois Indians and their concept of Ondinnonk: this is a form of dream divination which stipulates that if upon waking a dreamer does not undertake the actions they dream about then they are doomed to suffer a poisoning of the spirit in consequence. But it is only when Proud begins the actual physical search for the town of his dreams, and begins to systematically reconstruct the life story of a stranger dead for almost thirty years that the book really starts to exert its compelling grip. Granted this is a book which relies heavily on its 70s setting for its effectiveness. It couldn't, in all credibility, be written today where modern technology would make a nonsense of Proud's labourious and protracted searches. It has a menu of coincidence and pure serendipity to digest too; the sheer number of times Proud seems about to abandon his enquiries in despair before just happening to stumble upon exactly what he is looking for stretches credulity. But, putting that aside, this is a cracking thriller, peopled with well drawn characters steering it to a tense and ineluctable climax. Its interesting to reflect that a century or so ago reincarnation was considered an uncontentious subject; mainstream writers as diverse as Kipling, George Griffith and Jack London, amongst others, all made use of it in their work. Then it degraded into something only fit for use in the pulps. Nowadays it seems to be confined to chick-lit of the sort practiced by Barbara Erskine. Ehrlich's fine book seems to have been the product of a brief resurgent fad for the idea, one that also found expression in stuff such as Siodmak's HAUSER'S MEMORY. It was equally interesting to discover that Ehrlich was responsible for an episode of the original Star Trek: (the one with David Soul in it, if anyone's interested). The book was filmed by J Lee Thompson in 1975. Anyone out there able to own up to having seen it? Among the cast was a pre Lois Lane Margot Kidder playing the haunted and deranged Marcia. In light of the direction her life went in later years her role in it might be considered a case of fiction prefuguring fact. Addenda: the more I look at it that really is an unfortunate choice of still on the cover, isn't it. That's mighty impressive from the get-go. I haven't read the book but think I saw the film in the early to mid 80s. I recall little about it, though. I saw it recently and recall nothing of it.